This arc length calculator is a tool that can calculate the length of an arc and the area of a circle sector. In this article, we explain the arc length formula in detail and provide you with a step-by-step instruction of how to find the arc length. You will also learn the equation for sector area. Hence, the arc length is equal to radius multiplied by the central angle (in radians). What will be the angle between the ends of the arc? Let's say it is equal to 45 degrees, or π/4. Calculate the arc length according to the formula above: L = r * Θ = 15 * π/4 = 11.78 cm. Calculate the area of a sector: A = r² * Θ / 2 = 15² * π/4 / 2 = 88.36 cm². 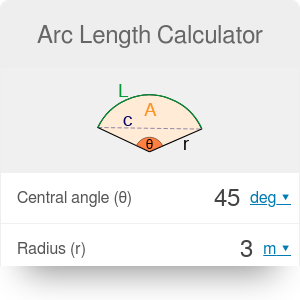 You can also use the arc length calculator to find the central angle or the radius of the circle. Simply input any two values into the appropriate boxes and watch it conducting all calculations for you. Make sure to check out the equation of a circle calculator, too! Arc Length Calculator can be embedded on your website to enrich the content you wrote and make it easier for your visitors to understand your message.